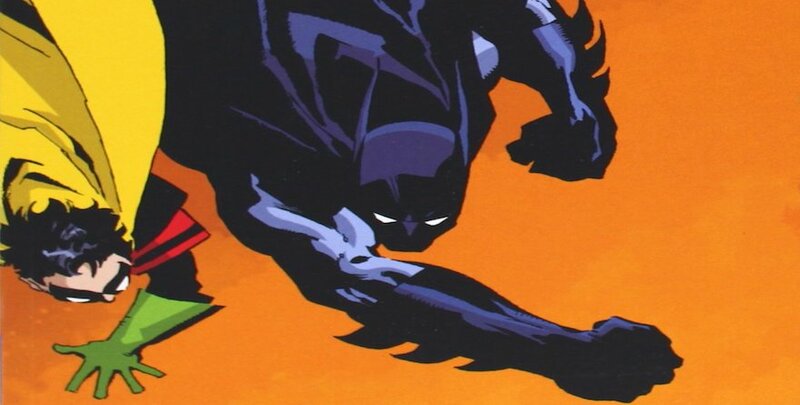 Join Batman as he once again has to play detective while defending Gotham. Jeph Loeb brings us anther dark tale. 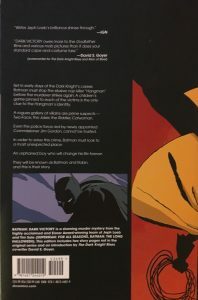 Batman: Dark Victory is the engaging sequel following The Long Halloween (a 5/5 comic from Gotham Archives) and will address a lot of the loose ends of its predecessor. As he reexplores the case of the Holiday Killer while dealing with a multitude of other complications along the way, we get to experience another, more personal telling of the franchise. With dark, underlying themes and a slightly different atmosphere to The Long Halloween, it is certainly an interesting comic that is worth looking into. 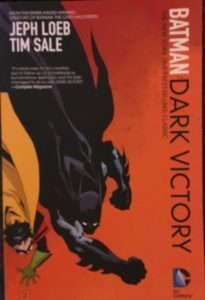 Dark Victory is a limited series book outside of Batman/Detective Comics etc and is most notable for being the first appearance of Robin in the modern age. To comment on the artwork, it is definitely something that sticks out. Much like its predecessor, the comic’s art style has a lot of distinct lines and a rather dull color pallet. You can see the distinct style a lot with some of the more important characters like Alberto Falcone. 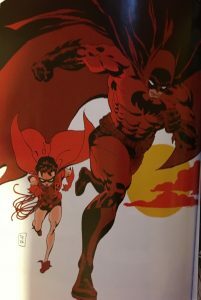 It is not the kind of style that you would find in more recent comics, but it is not really that kind of “classic” comic book look either. I did find that this more unique style grew onto me and I found this comic’s art more enjoyable than the artwork in The Long Halloween. The story opens up right where it left off in The Long Halloween. Even though the story may have ended in a “victory” in a sense, the events of the Holiday Killer really effected our heroes. The strain on Gordon’s marriage and the loss of Harvey Dent (you know what we mean) were two of the most noteworthy things. 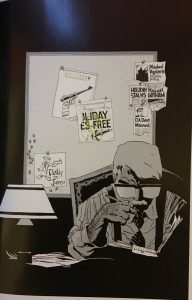 On top of catching readers back up on everything that had happened, the comic continued to address the personal issues that the characters faced throughout The Long Halloween. 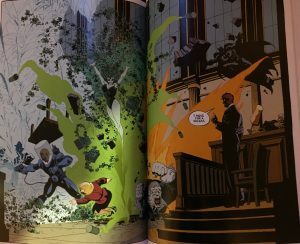 Even though the comic does provide a brief overview to everything that had happened, I would highly recommend that you read The Long Halloween before starting this installment. It is not impossible to understand what is going on, but I feel like it is a far more enjoyable read if you take the time to engage yourself in the entire story. The setting of the comic is back in Batman’s earlier years. The way the installment is written and the issues it addresses really make you question how much the events of this continuation affected him. The story opens right up with things not doing so well for Gordon. His wife and child are gone and he is left to mourn the loss of a friend all alone and flooded with work. 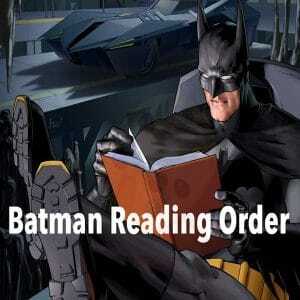 On top of all of it, the new district attorney does not seem so keen with his approvals of Batman. 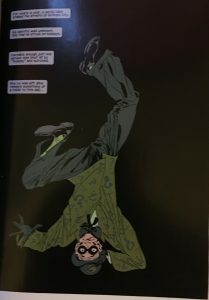 After just recently reading The Long Halloween and being so emotionally invested with these characters, I have to say I really feel bad for Gordon These events really seemed to leave a permanent scar, and like all other Batman installments, things were only about to get a lot worse. On top of that, I feel like him and Batman are often the same in many aspects, just Gordon is a lot more upfront about them. In other words, we were only moments away from Batman really breaking down. I think the worst of the beginning scenes can be summed up by this interaction. It doesn’t take long for more signs to appear. 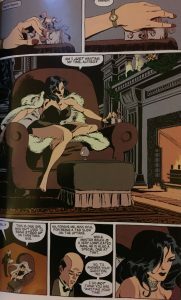 With Selina (in and out of the cat suit) playing a big role of this installment, she quickly warns Batman that Dent is in danger. On top of all of this, the Holiday murders have started again, and as you can image, Batman does not take very well to being wrong. It is here that we catch a rare glimpse of Bruce Wayne being affected by this. In a heartfelt exchange with Alfred, he starts to open up about his feelings with Dent. About how he nearly shared his identity with him and how he was frustrated with not being able to find him. Even about how he feels he is not allowed to be wrong. By the end of it he opens up about how he is pretty riddled with regret over not being able to stop him from becoming Two-Face. 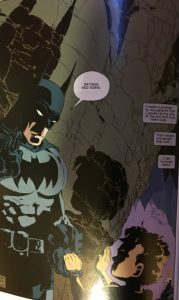 There are a lot of times where Batman is portrayed as incredibly serious and rather quiet and indirect with dealing with how certain events hurt him. Even when he does, it tends to be an angry outburst rather than a more quiet and depressing moment. Loeb did a great job portraying just how the man behind the mask is holding up with it. Still, this doesn’t stop him from going ahead to the streets of Gotham to fight crime -and there will be a lot of different fighting in this installment. Intense interrogation scenes, gang violence, and some fan favorite villains are among some of the obstacles he will run into along the way. Among some of these are The Penguin, The Joker, The Scarecrow, and, naturally, Two-Face. There is also more than enough gang stories to keep you going if you are more into the Godfather-esque and less into the costumed characters. While the stories were all written very well, my main focus was still on their personal lives and how all of these events were affecting them. 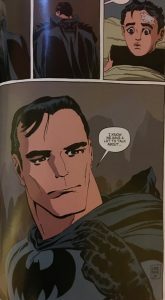 Batman and Gordon were both completely drawn into the whole event going on, and as a reader, I found myself rooting for them to work out their issues from the sidelines. Gotham City is not very merciful though, and we found our beloved characters drawn out for a majority of the time. Of course, with all of the “holiday-themed” crimes, this means a lot of fighting during the holidays. It was so sad watching Gordon try to make things up on Christmas -of all holidays. He really was putting an effort out there, but Gotham waits for no one. Much like how the crimes impacted Gordon‘s marriage, you can tell how Bruce is slowly slipping away in a sense. He basically stood up Selina Kyle on Christmas Eve (although he was sweetly defended by Alfred). The strain that these incidents are having everybody’s personal relationships is really astounding. Watching him and Selina is at least a little humorous, however, watching Gordon is just downright depressing. 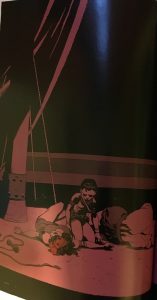 I think there is a lot to be seen from little things throughout the comic indirectly addressing Bruce’s state while he’s under the hood. With every fight, he references back to Dent, and begins to sympathize with some of the villains, even when they are straight-up trying to kill him. I think this is what really makes Batman more like Gordon and less like Dent. His insistence on keeping his enemies alive has become of his trademark characteristics. 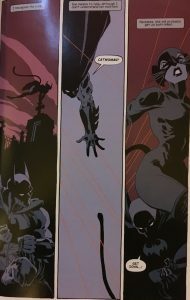 As much as the story keeps that serious and borderline depressing tone throughout all of the fight scenes and plot, the side story with Catwoman adds something a little extra. 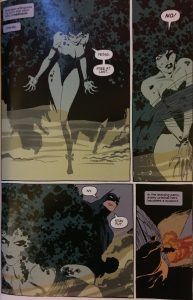 While it is no surprise to readers that Selina is Catwoman, it is pretty frustrating watching Batman be oblivious. Even going so far as so question their motives and relationships behind the mask. Of course, as with Gordon’s wife, their relationship will be addressed by the end of the comic a bit and I would rather not spoil it. In fact, there are a lot of things that I do not want to spoil because I feel this comic is one that is really worth reading. 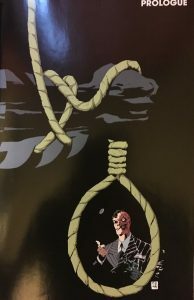 Considering how events in the Batman franchise go, when reading a comic for the first time, it is really hard for you to know which way the story is going to go. They will kill off or mutilate main characters. They will have entire installments where crimes aren’t solved. They will leave you on the edge of your seat as you never know if the next page is going to relieve you or rip your heart out. This is exactly how I felt after Gordon noticed that someone had set off the bat signal. Although there was evident danger, Gordon went ahead and pursued it and chaos began. I won’t say who did it or what happened, but just know this scene alone makes the entire comic worth reading. I have to give Batman Dark Victory a 4.6/5. This was an amazing installment that really did do justice to its predecessor, The Long Halloween. Although I must say I think I found the latter slightly more enjoyable, this was still an amazing comic that had everything you look for when you are reading a Batman comic. It had an engaging case that brought out the detective in you as you were trying to figure out who and what was behind everything (and I mean, even Batman was wrong!). It had a whole bunch of awesome action-packed scenes with some of our favorite evil characters. It had the drama and depressing moments as we followed the character’s individual personal lives. It even had romance going on! However, Dark Victory always seemed to be in the shadow of TLH – a curse which tends to happen to a follow up to a classic. 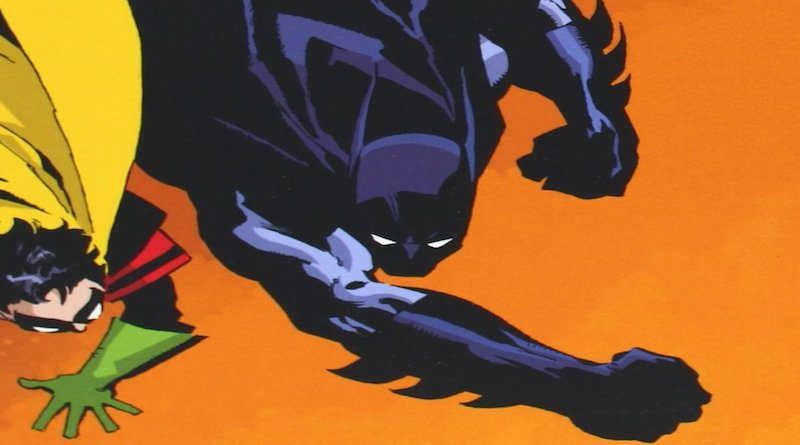 Whether you are new to comics or a long time fan, Batman: Dark Victory and The Long Halloween are two comics that you really should read. They are a great story to get you excited about franchise and an awesome classic for those more seasoned readers who are looking for a good comic.